Print illustrating Colonel Henry Bouquet, an English officer, negotiating peace with a coalition of Delaware, Seneca-Cayuga and Shawnee tribes at the end of the French and Indian War in 1764. The negotiations took place near modern day Bolivar, Ohio. 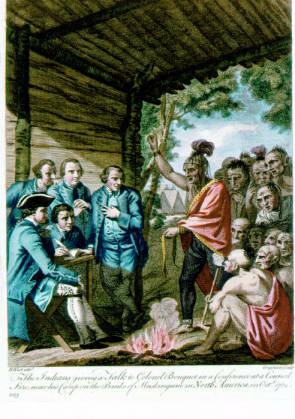 Caption reads "The Indians giving a Talk to Colonel Bouquet in a Conference at a Council fire, near his Camp on the Banks of Muskingum in North America, in Oct.r 1764." Leading European powers during the mid-18th century were in conflict with one another for control of land and dominance. These tensions developed into a multi-country confrontation known as the Seven Years War that pitted France, Austria, Sweden, Russia, and Saxony against Prussia, Hanover, and Great Britain. Conflicts were not just isolated to European boundaries but were on a global scale with hostilities expanding into territories surrounding India and North America. The struggle occurring within the colonies, centered on Great Britain against France, was known as the French and Indian War. North American territory was dominated by the British on the eastern coast, the French down in Louisiana up through Canada following the Mississippi Valley, and the Spanish in Florida. Each European power was vying for dominance within North America and all were aiming to claim the most land possible. Due to Spain’s miniscule settlement, the main contest for supremacy came between Great Britain and France. There were no clear dividing lines that separated New France from the British colonies so constant disagreements arose about who could claim what land. Specifically, regions around the Ohio Valley into the Ohio River and up near the Great Lakes produced the largest controversy. France, who first discovered the Ohio country, claimed control because they had not only arrived in that area first but also established trading centers to ensure a lasting hold on the region. In contradiction, Great Britain demanded ownership because the land grants issued by the monarchy allotted the colonies with claim to all areas expanding from the east coast to the not- yet-settled west coast. Since there was no specific border, British colonists, unhappy with the overcrowding occurring on the East coast, expanded their settlements into “French” lands, taking over already established areas for their own specific use. The French and many Native American nations were frustrated with these imperialistic actions of the British. Tensions escalated when the French built a trading fort, known as Fort Duquesne, in what would become Pittsburgh, Pennsylvania. Great Britain felt that this was strictly within their colonial territory. The British government sent over a representative, 21-year-old George Washington, to demand that the French relinquish their fort and return back to their own settlements. New France refused to accommodate the terms which provoked Washington and the small number of soldiers accompanying him to attack, thus stimulating the French and Indian War in 1756. The first physical conflictions between the two countries occurred at Fort Duquesne where the French were pitted against Washington and the newly-arrived General Edward Braddock. The British outnumbered the French. However, they were attempting to fight in the typical European style of open battlefield, marching toward the enemy lines and shooting at the opponent; whereas the French opted for a more guerilla warfare style of concealing themselves from the British while surprise attacking them. Many American Indians who were angered by the expansion of British colonies into their homelands aligned with the French during the war, although some, such as the Iroquois, affiliated with the British due to their frustration at France’s original colonialism. The bulk of the fighting occurred along Lake George and Lake Champlain, which allowed both sides to move supplies and troops relatively efficiently. Great Britain began the war with a series of unsuccessful attempts to take French forts. However, momentum shifted in favor of Great Britain when the British military was able to claim Fort Carillon, later named Fort Ticonderoga, and take Quebec. With the main fortress of Canada seized, India lost, and a weak showing in Europe, France realized that victory over Britain was nearly unattainable. In response, France attempted to organize a peace agreement with Great Britain but the demands of the British were too great to accept. Instead, King Charles III of Spain offered his services to aid his cousin, King Louis XV of France, in case the British did not agree to a peace terms by May 1, 1762. This arrangement was known as the Family Compact. This alliance was meant to provide an incentive for the British to end the war, however, France saw the alignment as an option for victory. Overall, this was not strategically beneficial as the British Navy completely overpowered the Spanish navy and was able to gain the French Caribbean Islands, the Philippines, and Spanish Cuba. With this loss of territory and a failed invasion of England, the French diplomats sought peace. In 1763, the European powers of Great Britain, France, Spain, and Portugal collectively signed the Treaty of Paris, thus ending the Seven Years. Great Britain received the main rewards from the agreement as France and Spain both gave up the territories they held within North America. However, Great Britain paid a heavy price to execute the expensive multi-war front and was left with heavy debts. In order pay these debts, the British government began to issue high taxes upon the citizens and the products they bought. Also, in order to keep compatible relations with American Indians in the region, the monarchy issued the Proclamation of 1763 to reduce the amount of westward expansion of Anglo-American settlers into the freshly-obtained territory to the west of the Appalachian Mountains. With higher living expenses and reduced abilities to expand settlements, colonists became disheartened with the British government, a sentiment that would eventually develop into the American Revolution.